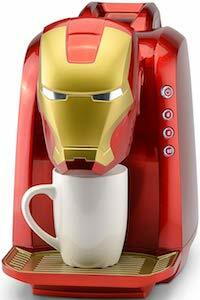 Now you can start your day as a superhero all thanks to this Iron Man coffee maker. The Marvel coffee maker is red and the front has the helmet of Iron Man. This is a single serve coffee maker that comes with a coffee basket for your own coffee grounds but it can also be used for Keurig K-Cup pods. On the back of the coffee maker you will find a removable water tank. You can pick the size of your coffee from 6, 8, and 10 oz. Just imagine having this cool coffee maker in the kitchen or maybe even the office. Now every morning you can have coffee from Iron Man. If you are a big fan of Iron Man then you just need this Tony Star arc reactor t-shirt. 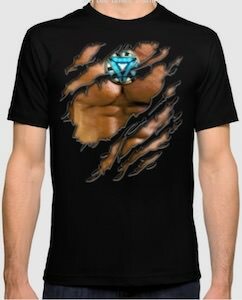 The shirt looks like it is ripped and under the ripped fabric it shows the muscled body under it and there is an arc reactor just like the real Tony Stark has and this time it kinda makes you into Tony and that means that you are Iron Man. So now you can have the Iron Man shirt anyone wants. If you like Iron Man and have keys lying around that need a home then you will need this Iron Man key chain. The key chain is 3D and really looks like Iron Man and it even brings light to the dark as it has an LED flashlight build in. From the head of Iron Man a chain with key ring appears and on the key ring, you can hang all your important keys and that way you know that a Marvel superhero is watching your keys. 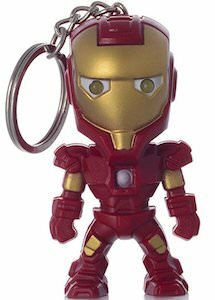 No more boring key chains for you because Iron Man will make it cool to have a key chain again. 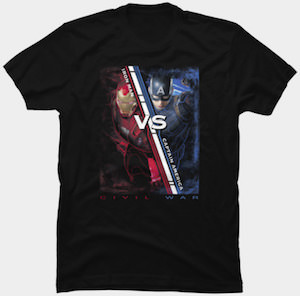 If you like to see a battle between Captain America and Iron Man then this Captain America Civil War t-shirt is what you want. On the navy blue t-shirt you can see in big letters “Civil War” after the Captain America movie and it shows a fight between Iron Man and Captain America and yes of course the shield of the Rogers is there to. You can get this Captain America Civil War t-shirt in men’s sizes Small – 3XL and all are made from 100% cotton for that perfect fit and feel you like so much. If you like a Marvel superhero t-shirt then why not check out this one as it shows two hero’s fighting it out. This black t-shirt is all about Captain America Civil War with two Marvel superhero’s ready to fight. On this black t-shirt you can see an image that shows Iron Man on one side and Captain America on the other with in the middle a line that says “Iron Man VS Captain America” and below the image in red and blue it says “Civil War”. You can get this Captain America t-shirt in men’s sizes Small – 3XL and all are made from 100% cotton and will look great on you. 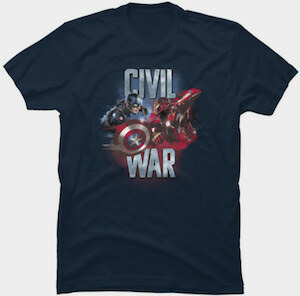 Now you can wear the battle between Captain America and Iron Man on your chest by simply wearing this t-shirt. Now you can wear Iron Man leggings and they will make you feel like you are part superhero robot and part human just like Tony Stark. The costume leggings have all the details you expect from these leggings with red, yellow and white details it really looks like you are wearing the legs from Iron Man. These leggings are great for workout, cosplay or a day in the park as they look and feel great to wear. Made from 92% polyester and 8% spandex these Marvel leggings are light weight, quick dry, sweat-absorbent and breathable. Sure people will notice you when you wear these Iron Man leggings but if you don’t like that then just stay home with the curtains closed. This Captain America cap is special and just click on the picture to see more images for different view. 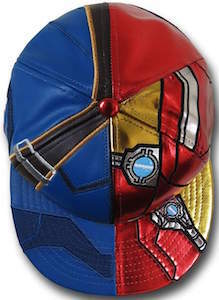 As you can see the cap is half blue and half red and yes it is half Captain America and half Iron Man witch makes this cap really cool and this Marvel baseball cap is even decorated on the inside on on the brim bottom it says “Civil War” as this cap is based on the movie Captain America Civil War. You can get this Captain America hat in many sizes so that you can get the superhero cap you want to wear. Iron Man and Captain America are not often fighting each other but they will be doing that in the new Captain America Civil War movie. 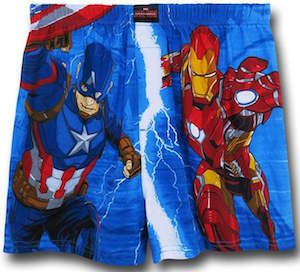 And you can now have men’s boxer shorts that have both Marvel superhero’s on them. This underwear is blue on the front and back and on the front you can see Captain America on the right and Iron Man on the left and both seem busy with some kind of action. You can get this superhero underwear in men’s sizes 28 – 42 and all are made from 100% cotton so that they are really comfortable to wear. If you are a women that would like a Christmas sweater with some superhero’s on it then you are in luck. 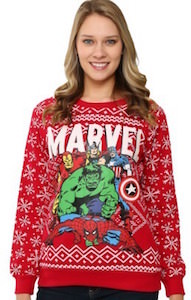 This Marvel ugly Christmas sweater has exactly that. 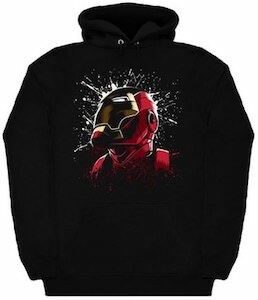 The red sweater is covers in snowflakes on the front and back and besides that it says in big letter “Marvel” on the front with below that Iron Man, Thor, Captain America, The Hulk and Spider-Man. You can get this Marvel Christmas sweater in women’s junior sizes Small – XL and al are made from 60% cotton and 40% polyester. Now the holidays can come because there will be a superhero on your sweater that will help you if needed.